Pale straw yellow color. Sweaty, candied aromas and flavors of circus peanut, banana pudding, and banana with a satiny, tangy, moderately sweet light-to-medium body and a smooth, brisk finish with accents of spiced apple and citrus finish. A pleasant fruity sweet banana liqueur for mixing. 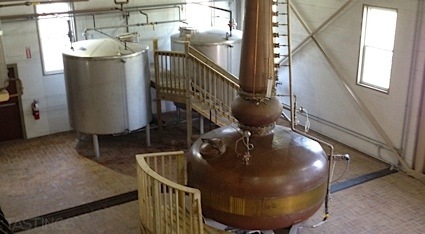 Bottom Line: A pleasant fruity sweet banana liqueur for mixing. 87 • Eleven Jones American Blended Whiskey 40% (USA) $12.99. 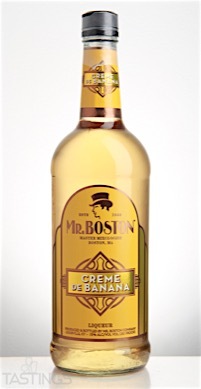 86 • Mr. Boston Creme de Banana Liqueur 15% (USA) $6.99. 84 • Mr. Boston Amaretto Liqueur 15% (USA) $6.99. 89 • Mr. Boston Peach Schnapps 15% (USA) $6.99. 86 • Mr. Boston Sour Apple Schnapps 15% (USA) $6.99. 87 • Mr. Boston Butterscotch Schnapps 15% (USA) $6.99. 87 • Tenure Vodka 40% (United Kingdom) $24.99. 88 • Tinkerman’s 4.2 Citrus Supreme Gin 46% (USA) $30.00. 91 • Tinkerman’s 6.3 Sweet Spice Gin 46% (USA) $30.00. 92 • Tinkerman’s 7.4 Curiously Bright & Complex Gin 46% (USA) $30.00. Mr. Boston Creme de Banana Liqueur rating was calculated by tastings.com to be 86 points out of 100 on 10/18/2016. Please note that MSRP may have changed since the date of our review.